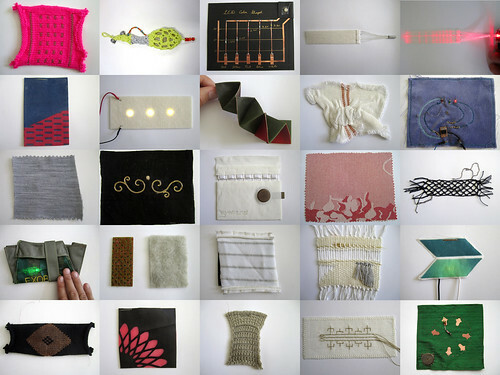 The E-Textile Summercamp‘s Swatchbook Exchange is a platform for sharing physical work samples in the field of electronic textiles. The exchange wishes to emphasize the importance of physicality and quality workmanship in an increasingly digital world. The Exchange takes place every year since 2013 as part of the 2013 E-Textile Summercamp in Paillard, France. Everybody participating in the exchange is either a past or current participant in the Summercamp, and creates as many multiples of their swatch as are participants in the exchange.